There are times when you want to binge on something healthy yet tasty. That necessarily doesn’t have to be a pack of potato wafers or fried snack, right? If you like finger foods you will surely like what I am going to share today. Pssst… I am sharing a recipe after a century it seems, but just bear with me. I am such a lazy blogger that I don’t know what to do with myself. LOL. We all like bruschettas, right? And it’s a shame that MS Word is suggesting me to spell check and change the word to brochettes!!! 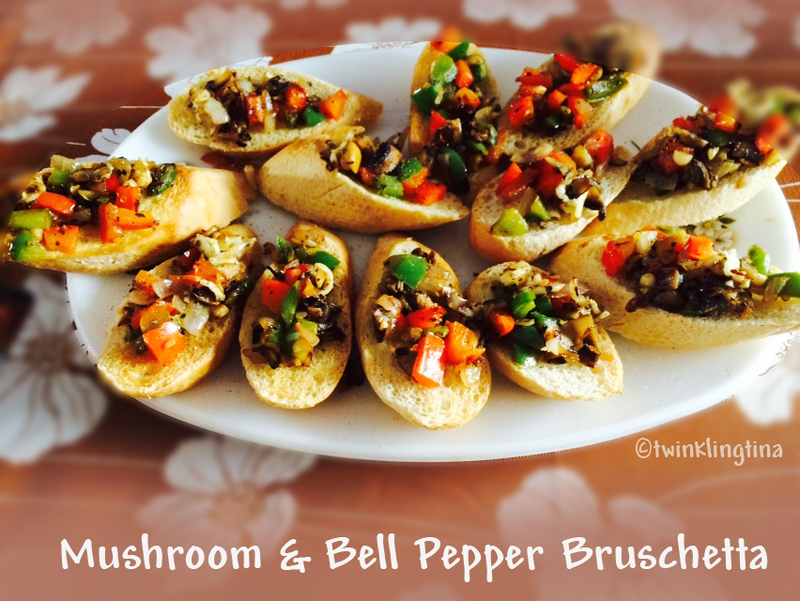 In case, you want to know more about bruschettas let me give you a quick brush through. 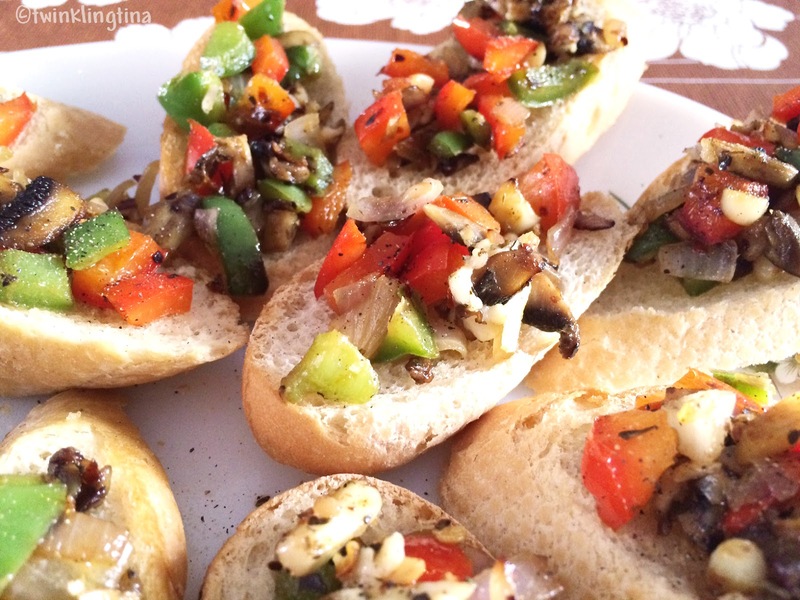 Bruschetta is an Italian appetizer – grilled bread with a garlic rub. And according to taste and convenience people add assorted toppings. Now thank the Italians for all their wonderful recipes. Most famous form of bruschetta is a tomato & cheese one. In fact, you can make some in the way you want. Here I am sharing one with toasted mushroom & bell papers. It is crunchy, it is healthy and it’s yummy. – In a skillet heat extra virgin olive oil and add garlic, onion, mushroom, bell peppers. Sauté for 2-3 minutes or till onions are translucent. – Add seasoning, chili flakes and oregano. Imp: Do not overcook. You don’t want the bell peppers to get soggy. We need that crunch of the wonderful bell peppers. – With the help of a spoon spread this veg mix on the French bread slices and serve warm. If you are adding shredded cheese then grill the bruschetta for two minutes in the oven.We enjoyed it without the cheese. You can add a little drizzle of olive oil for that extra shine. Wasn’t that really easy peasy? 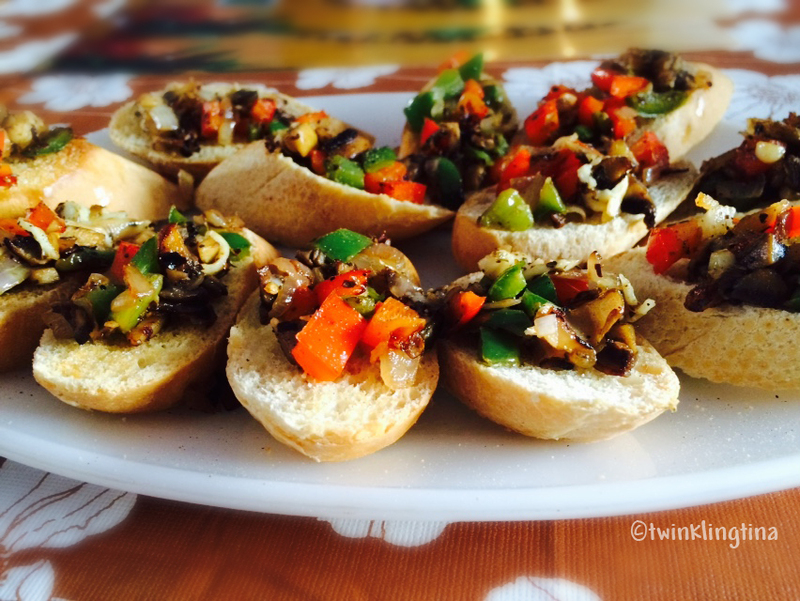 You can enjoy some bruschetta in your breakfast, or as a snack in your next brunch party. So until next time (which I’ll make sure is pretty soon) cheers! PS: all of this are clicked on my iPhone5S.